Youth sailing team, representing Redondo Beach, sweeps second annual keelboat competition. REDONDO BEACH—Apparently Redondo Beach can count yet another victory this month aside from the fight against corporate waterfront developers. 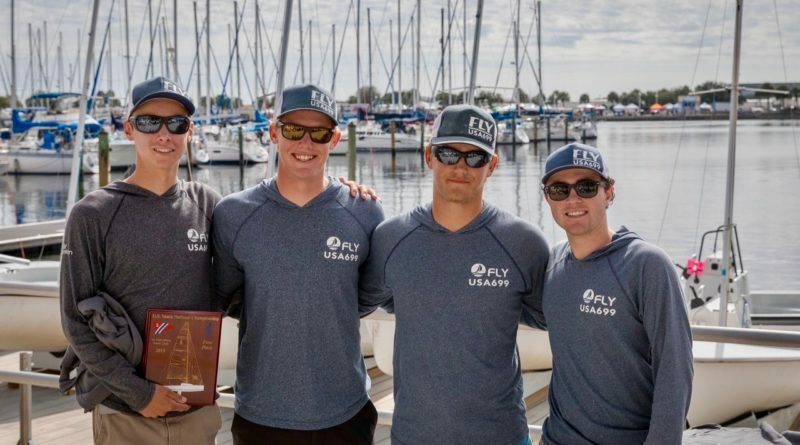 Kyle Collins, Brock Paquin, River Paquin and Justin Zmina, members of King Harbor Yacht Club (KHYC), walked away from the second annual U.S. J/70 Youth Championship with a first-place trophy in hand. The event took place over the weekend of Nov. 16-18 in St. Petersburg , Florida, and was hosted by St. Petersburg Yacht Club. Last year’s event, the first, was held in August in Newport, Rhode Island. Youth sailing teams from across the country competed against each other in a series of 21 races over the course of the three-day regatta. According to Scuttlebutt Sailing News, the KHYC Youth Team swept the competition with a 21-point lead. Smooth sailing conditions benefitted KHYC, with Little Traverse YC coming in second and Chicago YC shortly after in third.